With so many positive things to say about this trip, with the students’ reactions coming out top of the list, I must admit there are also negatives to this adventure. The speed and reliability of the Internet is a constant cause of frustration as I depend upon it so much, if nothing more than to communicate with my small band of readers. Mosquitos are an obvious nuisance although as I am in the habit of wearing long trousers, socks and shoes for school, I wear the same after sundown and so give as little of a target as possible. That, spraying, and constantly tucking the net under the mattress have reduced although not eliminated the bites. Until this morning those, plus of course THE HILL were the only negatives. 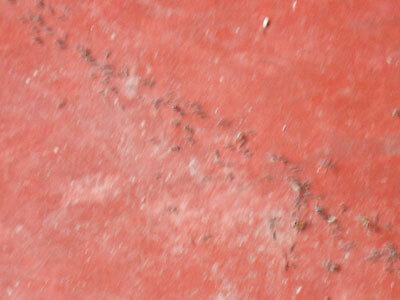 There are always ants around; quite small ones that scurry around on the path in front of my room. The path is down a step from the patio and we have developed a clear understanding. If they stay on their level, they are quite safe to go about their work with no interference. If they come up a level to my patio, it’s simple, they die. It’s worked quite well so far and I think the message is getting across, one or two play chicken by skirting along the very edge of the step but they usually drop down a level again after a harsh word. 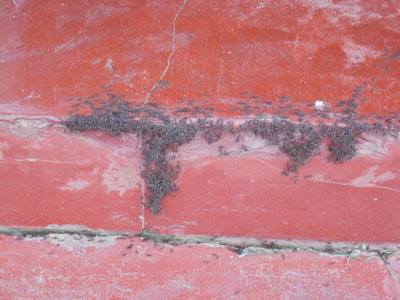 This morning though when I went across for my breakfast, there was not the odd ant running around but a veritable invasion of thousands of the things. These were not the little ones that I was used to; these were large ones, and not individuals, but marching in two solid files. They entered at the kitchen went across the corner of the room, up onto the draining board, back down again and out of the kitchen. Their journey then took them across the dining room out into the lounge and finally down the step and into the garden. My mind went to the story Miranda, Cliff’s mother, used to tell me about Zambia where you opened the front and back door and just let the ants through. Needless to say I walked very carefully around and over the marching columns, possibly not as carefully as Eva and Deo who both had sandals and bare feet. I took a few photographs and showed them to my students and the general comment was, “Dangerous, don’t mess”. Thankfully, I arrived home after school to find a complete absence of the creatures and when I asked Eva what had happened she laconically replied, “They have gone”. Obviously the ant at the head of the column must have decided there were better pickings elsewhere. I hope this doesn’t point my way or I will have to rethink my ‘live and let live’ policy.